Two Bb. 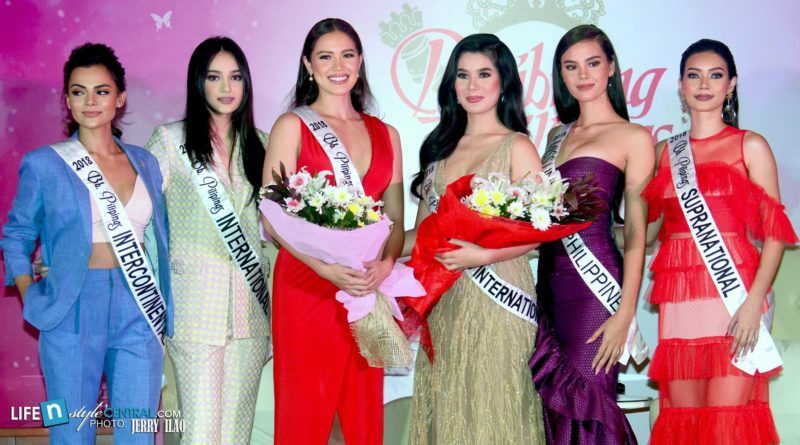 Pilipinas 2018 queens will raise the Philippine flag as they are about to compete for their respective international pageants – Bb. Pilipinas Globe 2018 Michelle Gumabao for Miss Globe 2018 and Bb. Pilipinas Grand International 2018 Eva Patalinjug for Miss Grand International 2018. Bb. Pilipinas Charities Inc. (BPCI) organized a rousing send-off press conference for these two gorgeous Binibinis last September 19 at Novotel Manila Araneta Center, Quezon City. Also in attendance during the event are there fellow queen sisters: Miss Universe Philippines 2018 Catriona Gray, Bb. Pilipinas 2018 International Ahtisa Manalo, Bb. Pilipinas Supranational 2018 Jehza Huelar and Bb. Pilipinas Intercontinental 2018 Karen Gallman, who gave their messages of good luck. “I am so excited that it finally come that you guys are about to go and head off to join your respective pageants. I know you guys will do so well. I have great faith that you smash it out because not only you are beautiful, smart and driven but you have great confidence. I have no doubt once you walk into that room you would fly up. I do hope and pray that you would bring home the crown and we are so proud of you. Enjoy the moment and have fun,” Karen Gallman said. “I wish you all the best and wish you luck. I know you’re both forces of nature so I know na you do well in your respective pageants, Miss Globe and Miss Grand International. Sana eh enjoy nyo lahat. This is a once in a lifetime opportunity and eh grab nyo lahat ang pwede niyo ma inspire. ‘Yun naman ang purpose natin dito eh. Pray and always remember na mahalaga ang peace of mind natin dahil ‘yun ang magdadala ng confidence sa atin throughout the journey. Thank you and I’m happy to be your sister,” Jehza Huelar said. Miss Universe Philippines 2018 Catriona Gray in fashion during the send-off press conference of Gumabao and Patalinjug. “To Michelle and Eva, we have gotten to know each other over a crazy journey that is Bb. Pilipinas. Michelle being my buddy because 19 and 20. We were rommies also. Eva being this very statuesque, queenly woman who would always be so approachable na I always feel you are smiling that everyone can go up to you and have a conversation. We have seen your strength in different process and how hardworking you guys are being and that you continue to excel in your professions and hobbies as well here in beauty pageants. I think that makes you an exceptional women. I feel so blessed that we see you blossom and grow and we got to call you our sisters. I have so much faith in you both that you are going to do excellent. We will always be here for you. Laban lang. I know you will make the Philippines proud,” Catriona Gray message to the two queens. Eva Patalinjug aims to be the Philippines first winner of Miss Grand International crown. “Ate Michelle I know you did a lot of work before this competition and I know you have your preparations already. I know you prepared well and I know you gonna make us proud for whatever happens in Miss Globe. Also to Ate Eva, my favorite Cebuana. I super love you and I know you will do great job because I’ve seen you prepared and work hard. Hopefully you are our first Miss Grand International”, Ahtisa Manalo said to Gumabao and Patalinjug. Philippines had it’s first Miss Globe crown through Ann Colis last 2015. Will Michelle Gumabao follows Ann’s footsteps? Miss Globe 2018 pageant will take place on October 21 in Tirana, Albania. Meanwhile, the 6th edition of Miss Grand International 2018 pageant will be held in Myanmar on October 25.